Angels? from Forest Field wins 2015 rock album award! 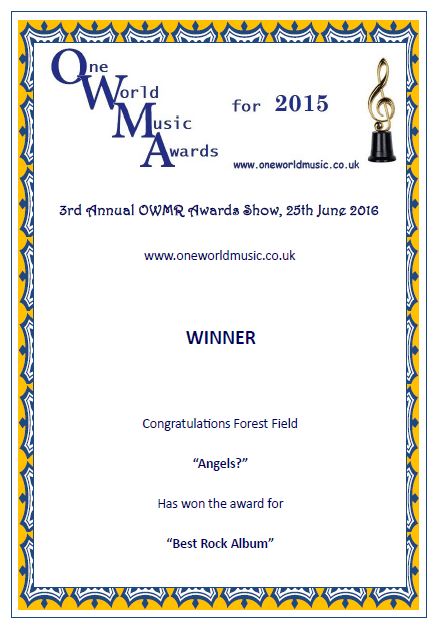 We are very proud to announce that Forest Field have won the 2015 One World Music Award for Best Rock Album. Some stiff competition, also from our Tragik – Come and Get It release, who we can congratulate on winning third place. The podcast with the award show is live on the show page and also features the album’s title track. We want to thank Steve and Chrissie from OWMR and their team of hosts and judges, who made this all possible! And to celebrate, for a limited time we have lowered the price of all the Forest Field albums (both digital and CD) and the Tragik album, in our webshop! Classic Rock Society likes Angels? If there was to be a prize for the most misleading cover of a prog rock CD, I would certainly nominate the Dutch band Forest Field. Their third CD, Angels?, comes in a carton card box with a cartoon on the cover showing a naked girl wrapped in yellow tape that carries the text “Caution, Keep Out”. For me, this signals ‘keep away!’ as this CD will contain some uninteresting drum ‘n bass, house, dance or techno musical adventure, all of which I’m totally uninterested in. But Forest Field is none of these at all, and that’s the first good thing about this album! The band is primarily a one-man project, with Dutchman Peter Cox playing all instruments and also adding some humming vocals in Left at Cloud 9 and Message For a Messenger, which are both essentially instrumentals. Phil Vincent, an American vocalist with whom Cox has also worked on former Forest Field albums, takes care of all vocals, recording remotely from Cox in an American studio. His voice reminds me of Iron Maiden’s Bruce Dickinson, and that’s not a bad thing! Musically, this album is a mixed bag. It starts off with the nice, atmospheric instrumental Broken Wings, with acoustic guitar, mellow synths, piano and fluid electric guitar. Half-way through there is a sudden and not-so-harmonious tempo break that doesn’t do the track full justice. While it appeals to me as it is, this first track is not at all representative of what the album offers. With four more instrumentals, varying from the short but nice Left at Cloud 9 through to the beautiful Message for a Messenger (there so much in that song that brings the Eagles’ Journey of the Sorcerer to mind, which is nice) to Lovers Lane, a guitar-driven instrumental that proceeds at a rather slow but enjoyable pace, reminiscent of Snowy White’s Bird of Paradise! The last instrumental is the inconspicuous In Excelsis, which suffers from a much too sudden fade-out. The album also offers more up-tempo songs, such as the title track, which shows a very different side of the band as it is a AOR song in the vein of Journey or Foreigner. Angel With a Dirty Face is another example of that style, with nice percussion played just after the time signature, which has an overall feeling of Foreigner’s Feels Like the First Time. The Zoo sounds like The Babys or Kansas during their Power-period, being a solid rock song built upon metal riffs with good vocals, a bluesy guitar solo half-way and a metal-ish solo at the end of the song. Too bad the vocals sound a bit distorted at the end when the vintage keyboards are mixed to the forefront. Inbetween is the ballad Looks Like Rain, which has very nice, slightly-distorted guitars following the harmony vocals and odd-time signatures, leading to an attractive bluesy guitar solo that makes this a great track! The album ends with the weakest track, Spot on the Sun, which has a rather non-descript rock melody, ending as suddenly as it starts. It is not an end worthy of this nice album. Peter Cox indicates on the inner sleeve of the package that not all of this project should be taken too seriously. Well, that may account for the sleeve (good practical joke!) but he has taken himself quite seriously in the music, which pays off due to its quality. Tracks such as Message for a Messenger and It Looks Like Rain are little gems. Not all of the album may be as progressive as many readers of this site would like, but it’s progressive enough to check out. * I have to credit Peter for focussing on the rock element, the compositions have an extra crunch, mainly because of the overly present guitar solos and melodies that Angels? holds. * Listen to his guitar solos on the instrumental In Excelsis and you hear he really has the skills and knowhow to pull off some fine guitar work. * It Looks Like Rain is a fine song with fine solos and The Zoo is another one I do like very much. Steve Sheppard from One World Music Radio has once again written an extensive review, and this time it is about the new album Angels? * So let’s start on another journey with Peter Cox and crew and the first piece is the opener called Broken Wings. This one is a classic Cox creation; you will find a tempo change at just over half way in and some stunning guitar work soon after, this is a really creative start to open up the album with, almost cinematic at times. arrangement of the composition and its structure with subtle tempo changes makes this one sublime and extremely listenable piece indeed. This track also contains some very delicious Floyd styled guitar within it as well. * Angel with a Dirty Face is in my opinion a clever and very carefully constructed composition that you can’t help but enjoy. Listen in at just over two minutes for some incredible elevation in energy. One has to admire the guitar of Cox on this track; the China White man has really pulled the stops out on this one, I truly believe that this should be released as a single; it has a superb melody and an extremely memorable chorus and I loved it. * The penultimate piece is called In Excelsis. The start is has a careful progression about it, then as the song moves through its narrative we are treated with a multitude of extremely well performed instrumentation. We nearly have a little Keith Emmerson styled hoedown on keyboards, but the driving guitar of Cox as always, takes the centre stage and once more creates an absolutely stunning composition. * I completely recommend this album to you all and its unique properties and stylish performance, its sublime production and arrangements had made this one of my favourite albums listened to so far this year. So don’t hesitate, make Angels part of your musical life right now, you won’t regret it. To read it in full click here. Thank you so much Steve for these wonderful words! You have been waiting for it, and here it is: the official presentation of the new Forest Field album Angels? ! Today the mailman brought us the new Forest Field CD. Days ahead of schedule, so thanks to De CDPerserij we can start sending out the album as of today! And you know we have that special offer going on don’t you?